Based in London, UK, Translation Services 24 are one of the leading providers of professional Albian translation services. We pride ourselves not only in the quality, accuracy of our work and wide range of language services, but also in the variety of the clients we work with, ranging from locally based SMEs and private clients to some of the world’s largest organisations. Working with such a varied client base, allowed us to develop a translation process, which not only guarantees accuracy and reliability, but also fast turnaround times and competitive pricing. In order for your documents to be accurately translated from or into Albanian, often the process must go beyond simply conveying words for words with their literal meaning. For example, the phrase ‘it’s raining cats and dogs’ makes a perfect sense to an English speaker, but wouldn’t make much sense in Albanian if translated literally. As a result, for your documents and content to work perfectly within an Albanian speaking market, Translation Services 24 will only accurately translate, but also carefully localise your material and documents, ensuring that they are completely suitable for the chosen, native Albanian audience. All of our translations are certified and recognised by courts of law, government bodies and other official institutions. When translating documents or material, there is a number of nuances which can directly or indirectly influence the quality and accuracy of your translated documents. Different dialects, language variations or even slang used within different communities can in many cases affect the translation. Here, TS24 we are fully aware of that and therefore all of our translators are native Albanian speakers, who have more than 5 years’ experience within the translation industry. When it comes to translating for a specific business sector, often, even having an in-depth knowledge of the Albanian language simply isn’t enough for the translation to be precise and reliable. In a number of cases, a knowledge of the particular business sector is also required. For instance, a conversation between two doctors would be completely different to a conversation between two lawyers and your translation must fully reproduce that, by accurately reflecting the terminology specific for your sector. 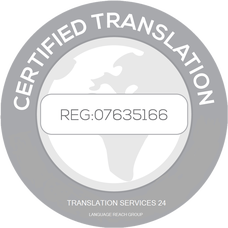 Here at Translation Services 24, we are fully aware of this and therefore your Albanian documents will not only be translated by a native linguist with an extraordinary language knowledge and understanding, but by someone who is additionally experienced within your given industry, whether its legal, medical or marketing sector. For majority of people, handling document translations can be an extremely stressful and time-consuming process, especially if they do not have any previous experience in doing so. Translation Services 24 work with the most talented and knowledgeable project managers in the translation industry, who are used to working under pressure. Additionally, in order to optimise our translation process even more, TS24 works with the most sophisticated software, which allows us to improve our translation processes. If you need your written documents translated from or into Albanian, or an interpreter to attend a meeting, or a conference, you can get in touch with us by emailing info@translationservices24.com or using one of the contact forms available on our website and we will get back to you with an accurate quote within 30 minutes! if you’d like to discuss your requirements with a member of our team directly, you can call us on +44 (0) 20 8677 3775 and we will be happy to answer any of your questions.